In February 2015, the Village Voice heralded the arrival of “New York’s Bravest” – Brooke Guinan, the first openly transgender firefighter in New York City. 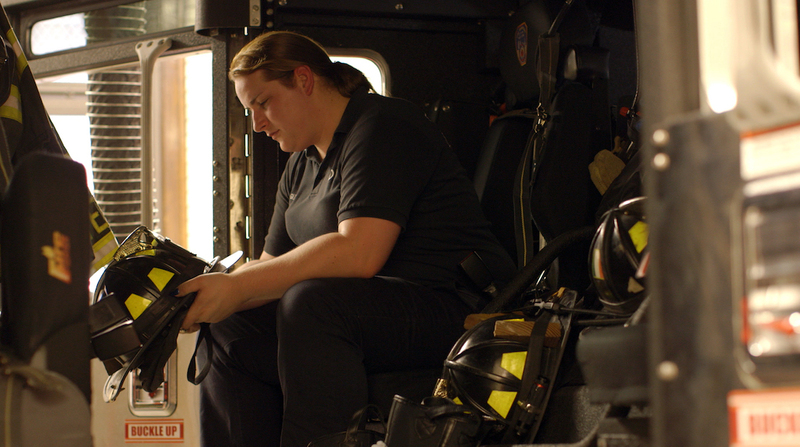 As a third-generation firefighter, Brooke has a passion for heroism that runs in her blood. Her father George is a respected lieutenant and 9/11 survivor with a 35-year legacy in the FDNY. People always asked Brooke if she would follow in her father’s footsteps. But when Brooke transitions from male to female in her father’s workplace, it poses not only a challenge to a macho profession, but also to the customs of the people she cares about the most – her traditional family. Meanwhile, Brooke’s boyfriend of two years, Jim, struggles with to come out to his family. A wise-cracking Air Force veteran, Jim still hasn’t told his mother that Brooke is a transwoman. Brooke and Jim realize that having the life they want means being vulnerable in the face of judgment. As we watch the couple buy a house together and consider marriage, we reconsider what it means to be man and woman, gay and straight, traditional and nontraditional. A heartfelt portrait of change in the American family and workplace, Woman on Fire is a testament to love, courage, and loyalty.